“And I want to see a manatee,” Vlad said. We were discussing our goals for our upcoming kayak camping trip along the Gulf Coast of Florida. The primary goal was to familiarize ourselves with the route of the WaterTribe Everglades Challenge, a 300-mile race from Tampa Bay to Key Largo that we hope to paddle next year. It’s held every March, and is open to all forms of small non-motorized boats, whether human- or wind-powered (the wind-powered boats usually win). There’s no fixed route—competitors simply need to get themselves from the start to the finish in the space of 8 days, although they must check in at three intermediate checkpoints. It sounds straightforward enough, but there are plenty of reasons it’s called a “challenge” (including a few that we learned on this trip). First is the sheer length, which requires paddlers to clock upwards of 30 nautical miles per day. Then there’s navigation, particularly if you opt for traversing the mangrove swamps in the Everglades. 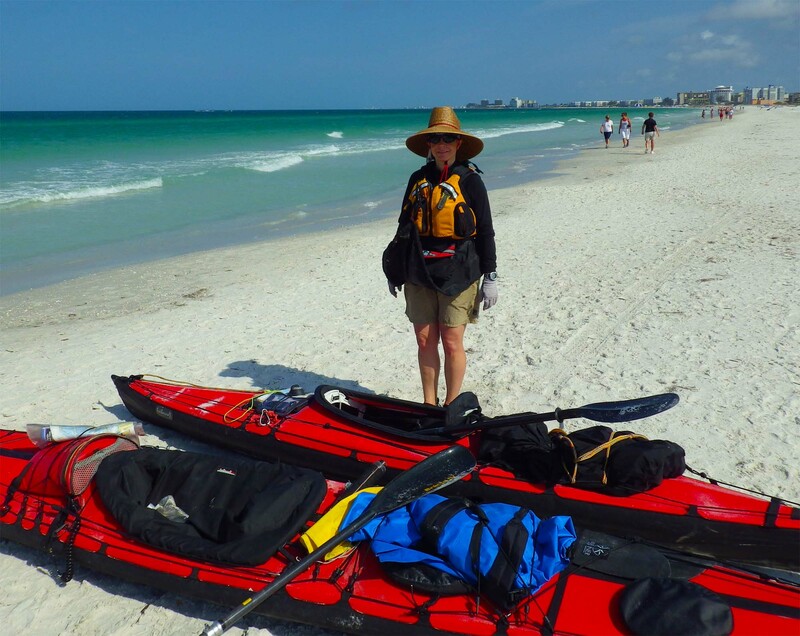 Your sea kayaking skills need to be up to snuff as well, since at least part of the route will take paddlers out on the open Gulf. Making and breaking camp quickly and efficiently can be its own challenge (as we were soon to find out). And finally, there are the dangerous animals: Alligators and snakes, but also raccoons (which reportedly love to steal kayakers’ food) and all manner of smaller biting and stinging critters, from mosquitoes to scorpions. We’d originally intended to paddle the Everglades Challenge this past February, but Hurricane Sandy knocked those plans for a loop by damaging Pier 40, our customary launch place. Since we couldn’t paddle for much of the winter, we were woefully out of shape. And to be honest, we weren’t really ready to tackle the Everglades Challenge. We’ve done a lot—but we’d never participated in a Florida race that required kayak-camping. That’s why we decided to start with a trial run: this trip. Our goal was to spend a week or so doing a stretch of kayak-camping along the route of the Challenge, to get a feel for the terrain and what we’d be facing. And, as Vlad noted, to experience some of the wilderness, including those dangerous creatures. On the bright side, we hoped to see a manatee (or two). As it turned out, we met more creatures than we’d bargained for!